Watford kicked off the new Premier League campaign in an impressive manner, currently sharing a joint first position on the table, only behind Liverpool and Chelsea on goal difference. The side currently also sits above defending champions Manchester City in the league table. The Hornets have managed to achieve a 100% winning rate out of the four Premier League games so far, for only the second time in Watford's history. Manager Javi Gracia, who was appointed in January, has played a pivotal role in the success of the team's season so far. Watford captain Troy Deeney has also stated that their impressive start to the season is because of the humble manager. Speaking to BBC, Deeney said, "He’s really humble. Even if you are not in the team no-one is complaining because you know the manager is doing his best and he’s a nice guy. You can talk to him and there’s no problem to knock on his door and ask ‘what can I do to get in the team?’ Everyone respects him and I think that comes from how he respects every player. That’s the way you want a manager to be." The Hornets captain then went on to reveal that the boss has imposed a few disciplinary fines upon the team, with the worst being a late fine of £100 for every minute a player is late. "We do the rules and the fines are done by the players as well," he told BBC 5 Live's podcast. "This year, the gaffer took charge of how much the fines were. "Some of the fines were very steep, some just quick ones that people didn't think were that bad. He's made it so all the fines are very steep this year and no-one is really messing about to be fair, so I think everyone likes their money too much." "The worst one is £100 a minute for being late. You could be on the M25 and you're sitting there for 35 minutes and its clocking up very quickly." Javi Gracia fines his Watford players £100 a minute for being late to training. 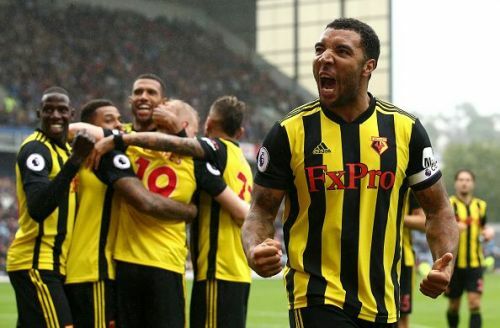 ⚽Watford captain Troy Deeney has said that current gaffer Javi Gracia fines his players £100 a minute for being late. ⚽Watford skipper Troy Deeney has revealed that gaffer Javi Gracia fines players £100 a minute for being late. Interesting. My admiration of Gracia grows weekly. Wonder what happens to the money, does the WFC trust benefit? Deeney confirming that Javi Gracia forces the players to pay £100 for every minute they are late to training. My manager. Watford's next match will be against Manchester United on Saturday.